I'll be all caught up on Merge's Or Thousands Of Prizes 7" series with this record. That only leaves one last package containing November and December's releases. I sure hope they go out with a band as this 7" doesn't really thrill me. We'll start off with Eleanor Friedberger's contribution "Open Your Soul To Me." It's just slow, NPR style indie rock. Kind of like a female fronted Ted Leo song that is missing all of the exciting things that Ted adds to his music. The song just never grabs me and it quickly turns into background noise. There's a sort of interesting Bright Eyes style flute thing that pops up halfway through, but it still isn't enough to really make me care all that much. Spoon is one of those bands that just never clicked for me. I know a ton of people who really, really love Spoon, but I never latched on to them. Their song on the split, "Waiting To Know You," certainly isn't about to change my mind. It's build off of bass guitar and 80's sounding synth through the intro and then once the verse hits, you get an awful lot of xylophone. I would kill for some loud guitars right about now. I realize I'm getting older, but maybe I'm not quite old enough to enjoy this sort of thing. 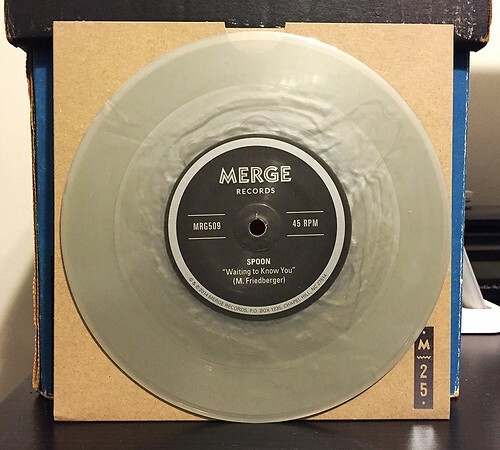 As a whole, Merge's singles series is putting out more boring records than good ones. Part of me wonders if I should have just bought the Superchunk/Mikal Cronin split on eBay and called it a day. There are two more records coming to hopefully change my mind, but I have a feeling I'm going to end up with quite a few records that I'm probably not going to play very often.